Here we report the results of Halt Cardiomyopathy Progression (HOPE)-Duchenne, a clinical trial of allogeneic CDCs (CAP-1002) in patients with DMD with established cardiomyopathy. Cardiac function and structure were assessed by MRI. Given the preclinical observations of improved skeletal muscle function,18 we also investigated changes in performance of the upper limb (PUL) and other assessments of dystrophic skeletal muscle function. HOPE-Duchenne is a phase I/II randomized, controlled, open-label clinical trial designed to evaluate the safety and explore the efficacy of intracoronary CAP-1002 in patients with DMD with cardiomyopathy. Three sites (Cincinnati Children's Hospital Medical Center, University of Florida, and Cedars-Sinai Medical Center) participated under an investigational new drug application (number 16479) permitted by the US Food and Drug Administration. Eligible patients were randomized 1:1 to either CAP-1002 plus usual care or usual care alone (control). An independent Data and Safety Monitoring Board reviewed trial design and data, provided safety oversight, and provided safety review of the first 6 patients randomized prior to recommending continued trial enrollment. All treatment-emergent adverse events (TEAEs) that were assessed by the investigator as related to CAP-1002 or the administration procedure and occurred during the 72-hour periprocedural period or were possible serious adverse events (SAEs) were reviewed and adjudicated by a Clinical Endpoints Committee independent of the sponsor and the clinical sites. Results here reflect analyses performed after all patients had completed 12 months of follow-up, the prespecified primary endpoint, or had terminated participation. The protocol was approved by each site's institutional review board. Written informed consent was provided by patients ≥18 years old. Younger patients provided written assent in addition to written informed consent by a legal guardian. The study is registered with ClinicalTrials.gov (NCT02485938). Eligible participants were male patients ≥12 years old with documented genetic diagnosis of DMD and cardiomyopathy with fibrosis in ≥4 left ventricular (LV) segments (based on the American Heart Association 16 segment model). 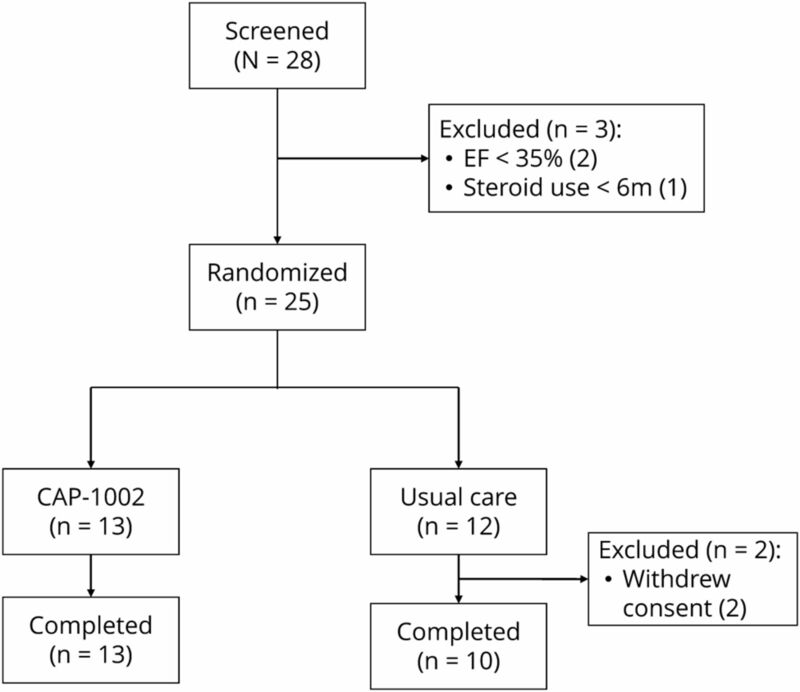 Patients could not have an LV ejection fraction (LVEF) ≤35%, were required to be receiving evidence-based medical care for >3 months and systemic glucocorticoids for >6 months prior to screening, and be candidates for cardiac catheterization. Patients were excluded if they were receiving IV inotropic or vasoactive medications, could not undergo MRI, had preexisting antibodies against all available CAP-1002 master cell banks (MCBs), planned surgery in the next 12 months, had implanted or had an indication for an LV assist device (LVAD), had moderate to severe valvular disease, had an active infection or systemic allergic reaction or autoimmune disease, had a history of cardiac tumor or prior stem cell therapy, had a known hypersensitivity to bovine products or dimethyl sulfoxide, had abused drugs or alcohol, were currently or recently participating in a related clinical study, or had HIV infection, chronic viral hepatitis, abnormal liver function, abnormal hematology, or uncontrolled diabetes. Eligible patients were randomized 1:1 to either CAP-1002 plus usual care or usual care alone using a dominant-biased coin design within each of 5 blocks of 6 patients each.19 Care providers were not masked to group assignment; cardiac MRI analyses were performed by a core laboratory blinded to treatment assignment and outcomes. The following protocol-defined periprocedural SAEs were assessed during infusion and within 72 hours postinfusion (or day 0 for control patients): (1) reduction in Thrombolysis in Myocardial Infarction grade flow >3 minutes, (2) sudden unexpected death, and (3) major adverse cardiac events (MACE), defined as the composite incidence of death, nonfatal myocardial infarction, and hospitalization for cardiovascular event. Nonperiprocedural SAEs were assessed at 6- and 12-month follow-up visits and included the following: (1) sudden unexpected death, (2) MACE (defined as above plus emergency room treatment for heart failure, LVAD placement, or heart transplant), (3) hospitalization due to cardiovascular cause, (4) new or increased ventricular tachycardia episodes >30 seconds, (5) development of donor-specific antibodies (DSAs) indicating sensitization to CAP-1002 donor human leukocyte antigen (HLA) at immunologically significant titers, or (6) increased cardiac troponin (cTn) and creatine kinase-MB (CK-MB) levels. Exploratory efficacy assessments included LVEF, LV end-diastolic and end-systolic volumes (LVEDV and LVESV), systolic wall thickening, LV circumferential strain (ɛcc), myocardial fibrosis, 6-minute walk distance, upper limb function by PUL, respiratory function by spirometry, and quality of life (QoL) metrics. Donor hearts were obtained from an organ procurement organization, tissue was dissected and explants were cultured, explant-derived cells were collected to comprise an MCB, cardiospheres were formed in nonadherent culture, CDCs were expanded over several passages, and CAP-1002 doses were formulated and cryopreserved for storage prior to use. Additional information on the manufacture of CAP-1002 is provided in the supplemental e-Methods (doi.org/10.5061/dryad.7651036). Patients randomized to CAP-1002 underwent infusion on study day 0. A single maximum dose of 25 M cells was delivered to each major coronary artery with a Terumo (Tokyo, Japan) Finecross MG catheter, for an intended total dose of 75 M cells per patient. A 12.5 M cell dose was administered to any unusually small coronary artery, at the discretion of the site investigator. A wash solution was administered before and after each dose of CAP-1002. Infusion stopping criteria were prespecified. Patients were observed in the hospital for 24 hours following infusion; vital signs and cardiac biomarkers were assessed every 8 hours. On study day 1, patients initiated home 72-hour continuous cardiac rhythm monitoring (Zio XT Patch; iRhythm Technologies, Inc., San Francisco, CA). Humoral and cellular immune responses to CAP-1002 were assessed by Luminex (Austin, TX) single antigen bead assay (One Lambda; at screening and each postinfusion study visit) and enzyme-linked immunospot assay (Cellular Technology Limited [Shaker Heights, OH]; at screening and week 6), respectively, as described in the supplemental e-Methods (doi.org/10.5061/dryad.7651036). For assessing development of DSAs following infusion, a mean fluorescence intensity (MFI) >5,00020 was considered clinically meaningful sensitization to donor HLA. Patients underwent cardiac MRI at screening and at 6- and 12-month follow-up. Cine images were utilized for quantification of LV volumes, LVEF, wall thickness, and thickening. Tagged images were utilized to assess ɛcc. For quantification of myocardial fibrosis, late gadolinium enhancement (LGE) images were acquired ∼8 minutes after IV administration of gadolinium contrast (0.2 mmol/kg); the fibrotic areas were determined using the full-width half-maximum method.21 Regional data were generated according to the American Heart Association 16 segment model. Detailed information on image acquisition protocols and MRI analysis is provided in supplemental e-Methods (doi.org/10.5061/dryad.7651036). Master physiotherapists trained and certified at least 2 clinical evaluators per site who then conducted the following assessments: PUL Scale, 6-Minute Walk Test (6MWT), and spirometry. Patients were evaluated at screening, week 6, and months 3, 6, and 12. The PUL Scale (Module Version 1.2), a functional assessment of upper limb activities of daily living, includes 22 items: initial definition of the starting functional level, then 21 items subdivided into shoulder level (4 items), middle level (9 items), and distal level (8 items) dimensions.22 Additional information on PUL scoring is provided in the supplemental e-Methods (doi.org/10.5061/dryad.7651036). The 6MWT, modified for DMD,23 was performed in those patients deemed capable by the site investigator. Spirometry was performed as described in the supplemental e-Methods (doi.org/10.5061/dryad.7651036). QoL was evaluated at screening, week 6, and months 3, 6, and 12, using Pediatric Outcomes Data Collection Instrument (PODCI)23 and Pediatric Quality of Life (PedsQL),24 as described in the supplemental e-Methods (doi.org/10.5061/dryad.7651036). A target sample size of 24–30 was chosen to allow a reasonable number of patients for assessing safety and exploring efficacy. Safety measures were evaluated in all randomized patients who remained on study as of the reference time point (9:00 am, 7 days postrandomization). The primary efficacy population was modified intent to treat (mITT), predefined as patients in whom safety was evaluated and who had at least one postbaseline observation. Responder analyses were done using χ2 or Fisher exact tests with no imputation for missing data. PUL mid-distal response was defined post hoc as no change or increase in mid-distal PUL score compared to baseline, and lower functioning patients were defined post hoc as patients with baseline mid-distal PUL score <55. Binomial tests were used to test for probability of PUL improvement = 0.5, with no data imputation. Changes from baseline were analyzed using repeated measures multivariable linear regression with unstructured covariance. Model assumptions (e.g., normality of residuals, homoscedasticity of variance) were evaluated visually and, if not met, alternative methods were used, such as rank-based analysis of covariance with multiple imputation for missing observations or reporting results both with and without outliers (specific method used for each measure is indicated in figure legends and table footnotes). Baseline was included as a covariate in all analyses of treatment group differences other than responder analyses. Treatment group baseline differences were tested using 2-sample t tests. Within-group tests of location were done using 1-sample t tests or signed rank tests. Additional information on statistical analysis is provided in the supplemental e-Methods (doi.org/10.5061/dryad.7651036). Analyses were prespecified in a Statistical Analysis Plan unless otherwise indicated as post hoc. All tests were 2-sided with 0.05 significance levels, with no adjustments for multiplicity. Results are presented as mean and SD in the text and tables. All statistical analyses were done using SAS v9.4 (SAS Institute, Cary, NC). Is intracoronary administration of CAP-1002 (75 million CDCs) feasible, safe, and possibly effective in patients with DMD? This phase I/II study provides Class II evidence that for patients with DMD, intracoronary CAP-1002 is feasible and appears safe and potentially effective. Regarding feasibility, intracoronary administration of CAP-1002 was feasible in 13/13 patients. Regarding safety, the incidence of TEAEs was similar in CAP-1002-treated and control patients. Regarding efficacy, scar size decreased and inferior wall systolic thickening improved over 12 months in CAP-1002-treated but not control, patients. Furthermore, mid-distal PUL improved over 12 months in 8 of 9 lower functioning CAP-1002 patients, and no controls. Upon request from a qualified investigator and approval of the Steering Committee, the sponsor is agreeable to sharing unpublished anonymized data necessary for approved analyses. Sharing of data shall commence 3 years after completion of HOPE-Duchenne long-term follow-up and completion of the open-label extension (supplemental e-Methods, tables e-1–e-8, doi.org/10.5061/dryad.7651036). Twenty-eight patients were screened and enrolled between January 7, 2016, and August 15, 2016, of whom 25 eligible participants were randomized to either CAP-1002 (n = 13) or control (n = 12) (figure 1). Two patients were ineligible due to LVEF ≤35% and one due to insufficient time on glucocorticoids. All patients received the treatment to which they were randomized. One patient in the usual-care group withdrew consent shortly after the reference time point but prior to completing any follow-up assessments. Thus, this withdrawn patient is included in safety analyses but excluded from the mITT population for efficacy analyses. All patients assigned to CAP-1002 completed the infusion. Twelve of the 13 patients received the full intended dose of 75 M cells. One patient presented with an anomalous, small right circumflex coronary artery and therefore received a total of 62.5 million cells. The trial ended as planned and the last visit occurred in September 2017. All patients were receiving systemic corticosteroid therapy. The median (range) duration of steroid use prior to trial enrollment in the CAP-1002 group was 6.6 (0.6–17.0) years compared to 5.9 (0.5–8.0) years in the control group (p = 0.190 for treatment group difference). A detailed list of steroid type, dose, and treatment duration for each enrolled patient is provided in table e-1 (doi.org/10.5061/dryad.7651036). As detailed in table 1, most were receiving an angiotensin-converting enzyme inhibitor, angiotensin receptor blocker, β-blocker, or aldosterone antagonist. No patients were taking eteplirsen. No patient experienced protocol-defined periprocedural clinical events (table 2). Transient periprocedural increases in cardiac biomarkers were observed in all patients treated with CAP-1002. Interpretation of these elevations is complicated by the fact that all patients with an available baseline sample (n = 13 CAP-1002; n = 6 control) had elevated CK-MB levels and 8 of the CAP-1002-treated patients had elevated cTn levels at baseline, presumably due to the underlying cardiomyopathy. No clinical events (i.e., chest pain) associated with the elevated cardiac biomarkers were reported. Although the periprocedural elevations declined postprocedure, all patients with available samples had elevated CK-MB at 6- and 12-month follow-up. Two patients in each treatment group had cTn elevations greater than ×5 composite 99th percentile or at least 20% elevated beyond baseline at a protocol-specified routine assessment during the 12-month follow-up. One of the periprocedural cTn elevations was classified as an adverse event (AE); no cTn elevation observed during follow-up was classified as an AE. One patient treated with CAP-1002 developed a weakly positive (MFI >1,000 and <5,000) transient immune response against donor HLA antigens seen 2 weeks postinfusion, which resolved by week 6. The elevated DSA was not classified as an AE. All serious TEAEs and the nonserious cardiac and orthopedic AEs are detailed in table 3. The incidence of events was similar between groups. No TEAEs resulted in study discontinuation or death. Of all TEAEs observed, 94% were mild or moderate in severity. Four severe TEAEs were reported, 2 per group. In the CAP-1002-treated group, one patient experienced fever and confusion (described below). Incidence of fractures was comparable between groups. The most commonly reported TEAE was atrial fibrillation (AF; 39% of CAP-1002 patients [n = 5] and 8% of controls [n = 1]). All AF episodes were asymptomatic and self-limited, and all such episodes in CAP-1002 patients occurred during cell infusion. A total of 5 SAEs were reported across 4 patients, including 1 control patient (8.3%) and 3 CAP-1002-treated patients (23.1%). All SAEs in the CAP-1002 group began on day 0 and resolved within 2 days. One patient experienced fever and confusion (adjudicated as 2 separate SAEs) 4–5 hours after CAP-1002 infusion, which was adjudicated as uncertain relationship to CAP-1002 and the infusion procedure. Another SAE, an episode of ventricular fibrillation requiring defibrillation, occurred during diagnostic angiography prior to CAP-1002 administration, and therefore was adjudicated as related to the administration procedure but not CAP-1002. A patient was diagnosed with a urinary tract infection (UTI) on day 0 after CAP-1002 infusion, which was classified as serious, since his infusion hospitalization was prolonged. The UTI SAE was adjudicated as not related to either CAP-1002 or administration procedure. Finally, a control patient had a femur fracture on day 36. The fracture was classified as an SAE because it prompted a hospitalization. Two control patients missed cardiac MRI assessments because they withdrew from the trial (one after day 0, and the other before the month 12 visit). Figure 2 shows exemplar LGE images in short-axis section at end-diastole at baseline (left), 6 months (center), and 12 months (right), in a CAP-1002-treated (A) and in a control patient (B). Both baseline studies exhibited significant fibrosis, evident as white areas, in the inferolateral and anterolateral walls, consistent with DMD cardiomyopathy. In the CAP-1002-treated patient (A), but not in the control patient (B), the extent of fibrosis decreased progressively over time. Table e-2 (doi.org/10.5061/dryad.7651036) summarizes changes in scar size, as well as cardiac structure and function, by treatment group. At month 6, the mean (SD) absolute change from baseline in scar size was −1.11% (1.63) in the CAP-1002 group and −0.53% (2.86) in the control group (p = 0.09 for treatment group difference, p = 0.04 and p = 0.71 for change from baseline within CAP-1002 and control group, respectively). The treatment group difference was numerically greater by month 12: mean (SD) absolute change from baseline was −1.35% (1.78) in the CAP-1002 group vs −0.09% (5.47) in the control group (p = 0.03 for treatment group difference, p = 0.04 and p = 0.77 for change from baseline within CAP-1002 and control group, respectively) (figure 2C). (A, B) Short-axis LGE MRI acquisitions at end-diastole obtained at baseline (left), 6 months (middle), and 12 months (right) from a patient treated with CAP-1002 (A) and from a patient receiving usual care (B). Fibrotic myocardium appears hyperintense (white), while normal myocardium appears dark. The area of myocardial fibrosis decreased visibly in the CAP-1002-treated patient, but not in the control patient, over 6 months. (C) Relative change in myocardial scar (expressed as a percent of left ventricular mass) from baseline to 6 and 12 months are shown for control (blue, n = 11) and CAP-1002-treated (red, n = 13) patients; p values are from rank-based analysis of covariance with multiple imputation for missing observations (1 missing observation in control at month 12). Diamond is the mean, horizontal line within the box is the median, length of the box is the interquartile range, circles are individual observations. Changes from baseline in LVEF, LVESV, and LVEDV were comparable between groups at 6 and 12 months (table e-2, doi.org/10.5061/dryad.7651036). Unlike these global measures, changes in regional LV function appeared to favor the CAP-1002 treatment group. The 6-month change in systolic thickening in the inferior wall segments was significantly greater in the CAP-1002 group compared to the control group (mean [SD] absolute change: +7.8% [11.4] vs −4.5% [9.7]) (p = 0.04 for treatment group difference, p = 0.03 and p = 0.15 for change from baseline within CAP-1002 and control group, respectively). This effect appeared to be sustained at 12 months (p = 0.09 for treatment group difference, p = 0.04 and p = 0.40 for change from baseline within CAP-1002 and control group, respectively) (figure 3A). 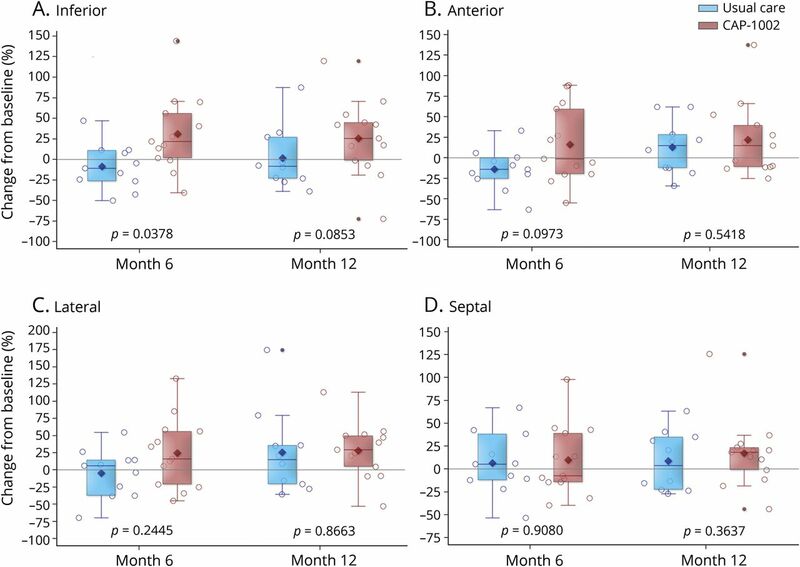 Also, 6- and 12-month changes in systolic thickening in the lateral and anterior wall segments numerically favored CAP-1002 (figure 3, B and C). In contrast to the inferior, lateral, and anterior segments, changes in systolic thickening in septal segments were similar between groups (figure 3D). Relative change from baseline in left ventricular wall thickening via cardiac MRI in the (A) inferior, (B) anterior, (C) lateral, and (D) septal regions is displayed for usual care (blue, n = 11) and CAP-1002-treated (red, n = 13) patients at 6 and 12 months; p values are from repeated measures multivariable linear regression with baseline as a covariate and unstructured covariance. Diamond is the mean, horizontal line within the box is the median, length of the box is the interquartile range, circles are individual observations. The mean (SD) percent changes from baseline to 6 weeks, 3, 6, and 12 months, respectively, in combined middle-plus-distal PUL dimension were +8.8% (15.0), +8.9% (15.4), +0.9% (8.7), and +7.0% (17.6) in the CAP-1002 group, and −1.7 (3.7), +0.8 (3.7), −3.9% (9.5), and −2.53% (5.1) in the control group (figure 4A); none significantly differed by treatment group. By post hoc responder analysis, mid-distal PUL score was sustained or improved in 83%, 83%, 58%, and 83% of CAP-1002-treated patients at 6 weeks, 3, 6, and 12 months, respectively; the respective percentages for controls were 56%, 70%, 45%, and 44%. 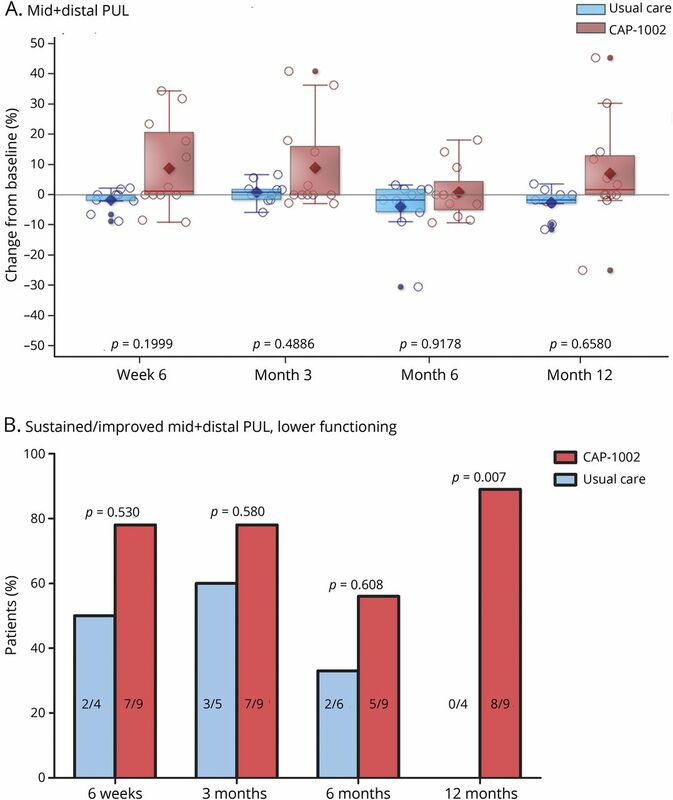 When the post hoc analysis focused on lower-functioning patients, in whom bidirectional changes from baseline were possible, mid-distal PUL score was sustained or improved in 78%, 78%, and 56% of CAP-1002-treated patients at 6 weeks and 3 and 6 months, respectively, compared to 50%, 60%, and 33% of controls. At 12 months, mid-distal PUL score was sustained or improved in 89% of CAP-treated patients compared to none of the controls (p = 0.007) (figure 4B). In a complementary post hoc analysis, we tested the null hypothesis that any changes in PUL from baseline to each follow-up visit are randomly distributed between loss or gain of function, as expected in the absence of disease progression, i.e., the binomial probability of PUL improvement = 0.5. The null hypothesis was not rejected at any time point in CAP-1002 patients (p = 0.74, 0.74, 0.10, 0.74 at week 6, month 3, month 6, and month 12, respectively), but was in controls, where functional declines were apparent (p = 0.046, 0.025, 0.014, and 0.046 at week 6, month 3, month 6, and month 12, respectively). This analysis supports the concept that PUL worsens over time in controls, consistent with natural history studies,25,27 while upper limb function remains preserved for at least 12 months in CAP-1002-treated patients. Table e-3 (doi.org/10.5061/dryad.7651036) details all PUL scores analyzed. (A) Relative changes in performance of the upper limb (PUL) middle + distal dimensions from baseline to 6 weeks, 3, 6, and 12 months is shown for usual care (blue, n = 11) and CAP-1002-treated (red, n = 13) patients; p values are from repeated measures multivariable linear regression with baseline as a covariate and unstructured covariance. Diamond is the mean, horizontal line within the box is the median, length of the box is the interquartile range, circles are individual observations. (B) Percent patients with baseline mid + distal PUL <55 who had preserved or improved mid + distal PUL at 6 weeks, 3, 6, and 12 months compared to baseline is shown for usual care (red) and CAP-1002-treated (blue) patients. Number of responders to total number of lower functioning patients are shown inside bars. p Values are from 2-sided Fisher exact tests. Patients with missing data at a given time point during follow-up were excluded from analysis at that time point (2 missing observations in usual care at week 6 and month 12, 1 missing observation in usual care at month 3). The patient with missing data at baseline was excluded from the analysis (1 patient in the CAP-1002 group). Mean changes from baseline in PODCI scores were generally similar between groups (tables e-4 and e-5, doi.org/10.5061/dryad.7651036). Significant differences favoring CAP-1002 were observed for patient-reported global function at month 3 (p = 0.02 for both standardized and normative scores) and for the happiness score, both patient- and parent-reported (p = 0.03 and 0.0003, respectively, for both standardized and normative scores), at month 12. For PedsQL, significant differences favoring CAP-1002 were observed at months 6 and 12 for patient-reported worry (p = 0.047 and p = 0.043, respectively) and communication (p = 0.043 and p = 0.01, respectively) scales. A significant difference favoring control was observed at week 6 for the patient-reported treatment barriers scale (p = 0.01). There were no significant differences in the remainder of the patient-reported scales or in any of the parent-reported scales (table e-6 and e-7, doi.org/10.5061/dryad.7651036). No analyses were performed with the limited 6MWT data (n = 1–2 per group). Serial testing of pulmonary function by spirometry revealed significant differences in the change of forced expiratory time at 3 months (mean [SD] relative change from baseline: −4.76% [28.4] in controls vs +57.62% [83.2] in CAP-1002-treated patients, p = 0.030) and FEV1/FVC at 12 months (mean [SD] relative change from baseline: +5.92% [7.5] in controls vs −0.30% [3.2] in CAP-1002-treated patients, p = 0.034) (table e-8, doi.org/10.5061/dryad.7651036). Statistically significant treatment group differences were not observed for any other indices of respiratory function as assessed by spirometry. Unlike most clinical trials in DMD, which target younger ambulatory patients,31,32 we studied an older population with more advanced disease. HOPE participants were predominantly nonambulatory and had substantial cardiomyopathy without heart failure; they had severe limitation in shoulder function but preserved, albeit compromised, middle and distal upper limb function. Thus, in the HOPE population, both cardiac and upper limb function were optimally situated between severe loss of function, from which recovery would be extraordinary, and normal function, upon which it is impossible to improve. Patients treated with CAP-1002 (but not controls) showed improvement in regional cardiac function. The pattern of improvement is consistent with the unique distribution of myocardial fibrosis in DMD: scarring affects the inferior, lateral, and anterior LV segments disproportionately, while the interventricular septum is relatively spared.33,34 Thus, the improvements in regional function occurred in the cardiac regions burdened by scar earliest and most severely in DMD. The lack of change in global ventricular function is not unexpected since patients had relatively preserved LVEF. Upper limb function is particularly important for patients with DMD, as it sustains their waning independence. The improvement in upper limb function with CAP-1002 is noteworthy because CAP-1002 was infused into the heart; these off-target effects parallel the preclinical findings of benefit on skeletal muscle after intramyocardial CDC delivery.18 That 75%–85% of lower-functioning patients treated with CAP-1002 experienced sustained improvement in mid-level PUL over 12 months is notable; mid-distal level PUL tended to decline over the same time in the control group, with no responders at 12 months, consistent with natural history data.25 These concordant signals of efficacy in heart and skeletal muscle suggest not just slowed disease progression, but net improvements from baseline. In HOPE, CAP-1002 was administered only once. Given the progressive nature of DMD, a single administration of CAP-1002 provides only lower-limit estimates of potential therapeutic benefit. In the mdx mouse model, repeat CDC administration led to renewed net benefit.18 Repeat dosing of allogeneic CDCs, which has been validated preclinically in rats,35 may not only address durability of effect but could also recruit further functional improvement. This trial has several limitations. First, the trial design did not include a sham intracoronary infusion in controls, as this would be unacceptable in pediatric patients without a clinical indication to undergo cardiac catheterization. Second, HOPE was an early-phase trial and therefore not powered to detect treatment group differences in safety or efficacy. Third, LGE is not ideal for quantification of diffuse fibrosis in DMD, as it requires the use of presumptively normal tissue as a comparator. Fourth, a subset of enrolled patients (6/25, 2 treated with CAP-1002) were receiving systemic glucocorticoids for at least 6 months but less than 2 years at the time of enrollment. Given that glucocorticoids may improve muscle strength for up to 2 years,36 it could be argued that some of the improvement observed in CAP-1002-treated patients may be due to recent onset of glucocorticoid use. Nevertheless, PUL changes were comparable among CAP-1002-treated patients, regardless of whether duration of steroid use exceeded 2 years. Fifth, given that 93% of CAP-1002-treated patients in HOPE had exon deletions, it remains unknown whether CAP-1002 would confer similar benefits in patients with DMD carrying different mutations. Nevertheless, CAP-1002's composite mechanism of action, combining anti-inflammatory and regenerative effects, rationalizes (at least from a theoretical standpoint) its potential efficacy across the full spectrum of DMD, regardless of the underlying dystrophin mutation. Sixth, no statistical adjustments were made for multiple testing. Seventh, the responder analyses and binomial tests for PUL were post hoc, did not account for baseline imbalances, and excluded patients with missing data. Finally, the degree of scoliosis (which could affect MRI quality and spirometry results) was not captured in the trial. In brief, we report that a treatment originally targeted at DMD cardiomyopathy could potentially benefit both cardiac and skeletal muscle. Although an intracoronary route of administration was employed in HOPE, preclinical data suggest that IV CDC administration increases exercise performance and improves LVEF in mdx mice.37 Therefore, if CDCs act systemically, then much-simpler IV delivery may suffice, which is the anticipated delivery method in the follow-on HOPE-2 trial. These considerations motivate further clinical evaluation of repeated administrations of IV-delivered CAP-1002 in a larger, placebo-controlled trial of patients with DMD. This study was sponsored by Capricor, Inc., and funded, in part, by a grant from the California Institute for Regenerative Medicine (CIRM, CLIN2-08334 to Capricor Inc.); the remainder was funded by Capricor, Inc. CIRM monitored the progress of the study; however, Capricor is solely responsible for study execution, data analysis, and the content of this manuscript. The public funder of the study had no role in study design, data collection, data analysis, data interpretation, or writing of the report. The Article Processing Charge was funded by Capricor Therapeutics, Inc.
M. Taylor received funding for image analysis from Capricor, Inc. J. Jefferies serves on the scientific advisory board for Capricor, Inc., and Sanofi Genzyme. He is also funded by NIH grant NCT00005391. He receives research funding from Medtronic. He is a speaker for Sanofi Genzyme. F. Byrne reports no disclosures. J. Lima receives grant support only from Capricor, Inc. B. Ambale-Venkatesh, M. Ostovaneh, and R. Makkar report no disclosures. B. Goldstein serves as a consultant/proctor and speaker for Medtronic, Edwards Lifesciences, Abbott, and W.L. Gore & Associates. R. Ruckdeschel Smith is a full-time employee of Capricor, Inc. and holds Capricor stock options. J. Fudge reports no disclosures. K. Malliaras receives consulting fees from Capricor, Inc., and holds Capricor stock options. B. Fedor, BS, is a full-time employee of Capricor, Inc. and holds Capricor stock options. J. Rudy, BS is a full-time employee of Capricor, Inc. and holds Capricor stock options. J. Pogoda was a paid consultant to Capricor, Inc. L. Marbán is a full-time employee of Capricor, Inc. and holds Capricor stock options. D. Ascheim is employed by Capricor, Inc., and is funded in part by a grant from the California Institute for Regenerative Medicine (CIRM, CLIN2-08334) to Capricor Inc. E. Marbán is supported by grants from the US NIH, California Institute for Regenerative Medicine, and US Department of Defense and holds founder's equity shares in and is an unpaid advisor to Capricor, Inc. R. Victor reports grants and personal fees from Capricor, Inc. during the conduct of the study and grants and personal fees from Eli Lilly, outside the submitted work. Go to Neurology.org/N for full disclosures. The authors thank Mark Aminzadeh, MD (Cedars-Sinai Heart Institute, Los Angeles, CA), and Russell Rogers, PhD (Cedars-Sinai Heart Institute, Los Angeles, CA), for their contributions to the preclinical work with CDCs in the DMD indication, and Cath Jayasuriya (Coalition Duchenne) and Patricia Furlong (Parent Project Muscular Dystrophy) for guidance and discussion. This article is dedicated to the memory of senior author Ronald G. Victor, MD, who died on September 10, 2018. Dr. Victor's longstanding interest in the pathophysiology and treatment of DMD served as the critical motivation for the initiation of this study.
. The burden, epidemiology, costs and treatment for Duchenne muscular dystrophy: an evidence review. Orphanet J Rare Dis 2017;12:79.
. Cardiac phenotype of Duchenne muscular dystrophy: insights from cellular studies. J Mol Cell Cardiol 2013;58:217–224.
. Diagnosis and management of Duchenne muscular dystrophy: part 1: diagnosis, and pharmacological and psychosocial management. Lancet Neurol 2010;9:77–93.
. Diagnosis and management of Duchenne muscular dystrophy: part 2: implementation of multidisciplinary care. Lancet Neurol 2010;9:177–189.
. Myocardial fibrosis burden predicts left ventricular ejection fraction and is associated with age and steroid treatment duration in Duchenne muscular dystrophy. J Am Heart Assoc 2015;4:e001338.
. Arginine metabolism by macrophages promotes cardiac and muscle fibrosis in mdx muscular dystrophy. PLoS One 2010;5:e10763.
. Oxidative stress by monoamine oxidases is causally involved in myofiber damage in muscular dystrophy. Hum Mol Genet 2010;19:4207–4215.
. The role of reactive oxygen species in the hearts of dystrophin-deficient mdx mice. Am J Physiol Heart Circ Physiol 2007;293:H1969–H1977.
. Regenerative potential of cardiosphere-derived cells expanded from percutaneous endomyocardial biopsy specimens. Circulation 2007;115:896–908.
. Intracoronary cardiosphere-derived cells for heart regeneration after myocardial infarction (CADUCEUS): a prospective, randomised phase 1 trial. Lancet 2012;379:895–904.
. Intracoronary cardiosphere-derived cells after myocardial infarction: evidence of therapeutic regeneration in the final 1-year results of the CADUCEUS trial (Cardiosphere-Derived Autologous Stem Cells To Reverse Ventricular Dysfunction). J Am Coll Cardiol 2014;63:110–122.
. TCT-820 multivessel intracoronary infusion of allogeneic cardiosphere derived cells in dilated cardiomyopathy: long term outcomes of the Dilated Cardiomyopathy Intervention with Allogeneic Myocardially-Regenerative Cells (DYNAMIC Trial). J Am Coll Cardiol 2016;68:B332. Abstract.
. Intracoronary cardiac progenitor cells in single ventricle physiology: the PERSEUS (Cardiac Progenitor Cell Infusion to Treat Univentricular Heart Disease) randomized phase 2 trial. Circ Res 2017;120:1162–1173.
. Intracoronary autologous cardiac progenitor cell transfer in patients with hypoplastic left heart syndrome: the TICAP prospective phase 1 controlled trial. Circ Res 2017;116:653–664.
. Allogeneic cardiospheres safely boost cardiac function and attenuate adverse remodeling after myocardial infarction in immunologically mismatched rat strains. J Am Coll Cardiol 2013;61:1108–1119.
. Validation of contrast-enhanced magnetic resonance imaging to monitor regenerative efficacy after cell therapy in a porcine model of convalescent myocardial infarction. Circulation 2013;128:2764–2775.
. Exosomes as critical agents of cardiac regeneration triggered by cell therapy. Stem Cell Rep 2014;2:606–619.
. Exosome-mediated benefits of cell therapy in mouse and human models of Duchenne muscular dystrophy. Stem Cell Rep 2018;10:942–955.
. Balance and randomness in sequential clinical trials: the dominant biased coin design. Pharm Stat 2014;13:119–127.
. Preformed class II donor-specific antibodies are associated with an increased risk of early rejection after liver transplantation. Liver Transpl 2013;19:973–980.
. 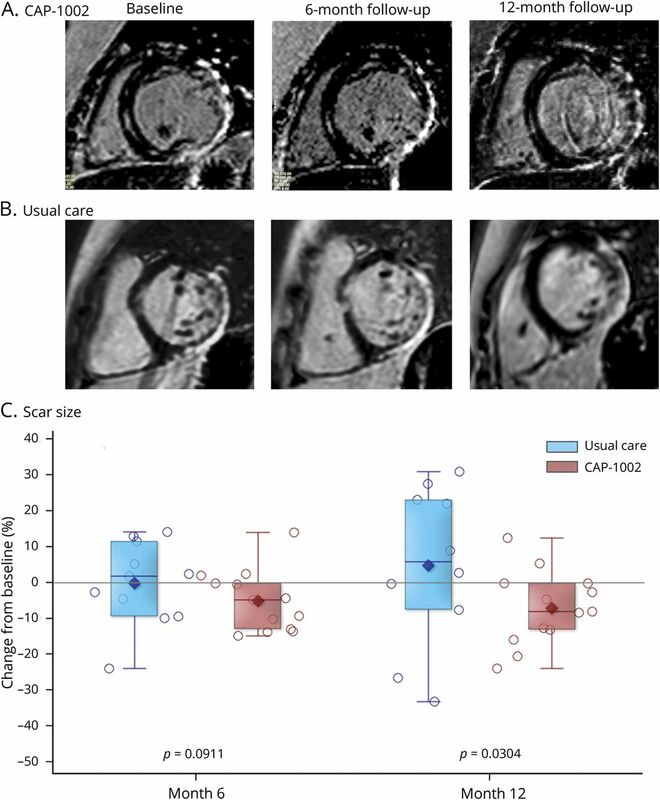 Accurate and objective infarct sizing by contrast-enhanced magnetic resonance imaging in a canine myocardial infarction model. J Am Coll Cardiol 2004;44:2383–2389.
. Reliability of the performance of upper limb assessment in Duchenne muscular dystrophy. Neuromuscul Disord 2014;24:201–206.
. The 6-minute walk test and person-reported outcomes in boys with Duchenne muscular dystrophy and typically developing controls: longitudinal comparisons and clinically-meaningful changes over one year. PLoS Curr 2013;5.
. The PedsQL in pediatric patients with Duchenne muscular dystrophy: feasibility, reliability, and validity of the pediatric quality of life inventory neuromuscular module and generic core scales. J Clin Neuromuscul Dis 2010;11:97–109.
. Categorizing natural history trajectories of ambulatory function measured by the 6-minute walk distance in patients with Duchenne muscular dystrophy. Neuromuscul Disord 2016;26:576–583.
. Benefits of glucocorticoids in non-ambulant boys/men with Duchenne muscular dystrophy: a multicentric longitudinal study using the Performance of Upper Limb test. Neuromuscul Disord 2015;25:749–753.
. A phase 3 randomized placebo-controlled trial of tadalafil for Duchenne muscular dystrophy. Neurology 2017;89:1811–1820.
. Vagal atrial fibrillation. Acta Cardiol Sin 2007;23:1–12.
. Autonomic dysfunction: a driving force for myocardial fibrosis in young Duchenne muscular dystrophy patients? Pediatr Cardiol 2015;36:561–568.
. Assessment of cardiac autonomic function in patients with Duchenne muscular dystrophy using short term heart rate variability measures. Eur J Paediatr Neurol 2014;18:317–320.
. Exon skipping and dystrophin restoration in patients with Duchenne muscular dystrophy after systemic phosphorodiamidate morpholino oligomer treatment: an open-label, phase 2, dose-escalation study. Lancet 2011;378:595–605.
. Safety and efficacy of drisapersen for the treatment of Duchenne muscular dystrophy (DEMAND II): an exploratory, randomised, placebo-controlled phase 2 study. Lancet Neurol 2014;13:987–996.
. Prevalence and distribution of late gadolinium enhancement in a large population of patients with Duchenne muscular dystrophy: effect of age and left ventricular systolic function. J Cardiovasc Magn Reson 2013;15:107.
. Late gadolinium enhancement: precursor to cardiomyopathy in Duchenne muscular dystrophy? Int J Cardiovasc Imaging 2009;25:57–63.
. Repeated transplantation of allogeneic cardiosphere-derived cells boosts therapeutic benefits without immune sensitization in a rat model of myocardial infarction. J Heart Lung Transpl 2016;35:1348–1357.
. Corticosteroids for the treatment of Duchenne muscular dystrophy. Cochrane Database Syst Rev 2016;5:CD003725.
. Intravenous delivery of cardiosphere-derived cells improves striated muscle function and structure in a murine model of Duchenne muscular dystrophy. FASEB J 2017;31:877.10. Abstract.